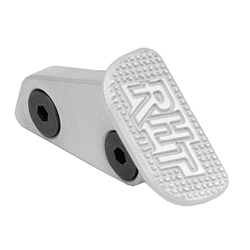 Other products by Rescomp "CR Speed"
The RHT Gas Pedal will allow you to shoot faster & more accurately while helping to tame recoil & improve your pistols ergonomics. CNC Machined from Aircraft Grade Aluminium. Grippy 30 LPI Chequered. Features C-More Hole Pattern or blank. . Available for Left & Right handed Shooters. RH goes on the left side and a LH goes on the right side. Thank you CR Speed for making a solid lefty option! Love it on my SteelMaster! Have this one custom-installed on my CZ TS and really like it. Part of liking is that it's installed at an angle relative to the frame (where the frame tapers off towards the trigger) so it feels very natural. It's smaller than the other pedals I have used, but very comfortable and slightly curved to match the curvature of the thumb.